Like a polar bear in a Greenpeace meme… – What's Up With Francis-Church? Waking up yet? Shall I put a pot of coffee on? No no, nothing to see here… go back to your regularly scheduled normalcy bias. Thank you for your clarification. Now I can sleep at night. I wish people would stop thinking I have a solution. Either Francis’ papacy is valid and Catholic Tradition false OR Francis’ papacy is invalid and Catholic Tradition prevails against the gates of hell. If Francis remains a valid Pope then Catholicism (institutional) has perpetrated the greatest fraud in history. If Francis is determined to be an invalid anti-pope Bergoglio will go down in history as the greatest individual fraud. Okay, if I understand you right, we’re on our own now so just chant vespers in Latin? Well said. Thanks for having the courage to say you are right when you are. That comes from following the Faith. Those who say they believe but equivocate in the public square are not worth listening to. And are most indeed part of the problem. God deliver us all from cowardice in the days ahead. Yes, this is true in most places. But it is also true that increasintly, the few younger people are a great deal more devout, determined and educated. Many of them are self-described traditionalists, and many more are moving in that direction. 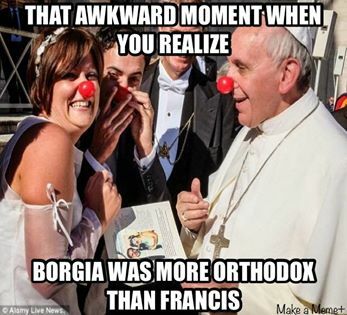 And it isn’t Francis that has hollowed out the Church, emptied the pews and seminaries and convents, and desacralized the Mass and erased the culture and the history. Most of the neo-cons I know, and I was one until a year or so ago and didn’t know it, are just your average Roman Catholic, attending Mass on Sundays. Most practicing Catholics I personally know, are in the 60’ish range, or upwards. I mean, there just are not that many practicing Catholics in the younger age groups. Most people, are just living their lives, working, raising children, etc. They don’t have time, or maybe they don’t care, I don’t know, to know more about what is going on. I’m conjecturing, completely, but, I think most people just don’t know about the fact that the pope is a raging destroyer who has basically, eliminated mainstream Catholicism, leaving an empty shell in it’s wake. What will God hold them accountable for, when the pope himself has led all these people astray? When our Bishops teach heresy? Perhaps our punishment is already lined up, as our nations fill up with Muslims and our pope and bishops say, more, more, MORE! Tell us when it’s going to end Hilary. Soon or later? Being right is just the ticket to being left. Ponder that. Nice. HV was already modernist. Paging the Immaculate Heart!